George Lane is the first Lane in my family line. He is sitting on a branch up towards the top. I can see him peaking out between the leaves but can’t quite make out his features. He is my great grandfather’s great grandfather or my 4th great grandfather. The earliest record I have of him is his marriage to Sarah Brown in 1809. They were married at St Dunstan’s in Stepney (pictured above) on 5th March. The London Metropolitan Archives have scanned many of their church registers allowing me to see the mark that George and Sarah made. There were several witnesses to their marriage including an Elizabeth Lane – his sister? mother? aunt? George and Sarah were married for twenty years and had nine known children. It is possible that there were others and I have not yet found them. Their eldest child was born on Jan 10th, 1810 and she was called Sophia. Sophia was baptised 4th Feb 1810 at All Hallows, Tottenham. They then had William (born 29th Dec 1811) and Jane Battle (born 23rd June 1814) who were also baptised in Tottenham. George’s occupation is listed as labourer at Jane’s baptism. A second son was born to George and Sarah on 22 June 1816. He was baptised in September and George’s occupation is listed as Porter. By April the following year, the family have moved to Tower Hamlets and baby John was buried at St Dunstan’s. On March 24th, 1818, my 3rd great grandfather, Thomas (and the first Lane to move to Australia) was born. Curiously, the family’s abode is listed as Ratcliffe Cross yet Thomas was baptised in Tottenham. George’s occupation is listed as labourer. Between 1820 and 1822, three boys were born to George and Sarah. Two boys christened George and one, John. The first George was baptised on 3 Sep 1820 at St Dunstan’s. The second George was born in 17 May 1822 and baptised on 11th August at St Dunstan’s (the family appear to be living in Barrow St, Limehouse). I have yet to find a death record for the first George but is seems that he did not survive infancy. I believe the second George did not live long either as there is a record for a five year old George Lane’s death from drowning in 1827. John was also born 17 May 1822 and christened at St Dunstan’s on 11 Aug. He appears to be the second George’s twin. What is strange is that the records are written in different formats or possibly different record books. John died in December of 1822 aged 6 months. On 7 June 1825, a daughter, Susannah, was born to George and Sarah. Susannah was baptised in July and died in May 1827 at the age of 1 year and 10 months. Two years later, Sarah died. Up till now, what we know about George is a list of births and deaths spanning a twenty year period. We know that he was a labourer with a brief stint as a porter. The family is from the Tower Hamlets but did spend several years in Tottenham. And then George met Ann. 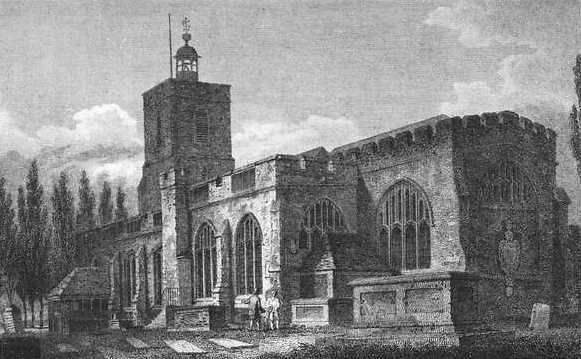 On 11th July 1830, George married Ann Woollard at St Dunstan’s. Ann is listed as a spinster and she could write her own name. This is the event that turned George from common labourer to licensed victualler. Through his marriage to Ann, George came to own an Inn called The Ship in Ratcliffe. George and Ann had no children together (that I know of) and I have been unable to find any reference to The Ship Inn. I still know very little about George. I think the evidence points to George and Sarah living in poverty evidenced by their children’s inability to survive. Of the nine children born to them, I have evidence for only three making it to adulthood. However, at the time of his death, George was able to leave property and effects to his wife, Ann. I strongly suspect that they were hers to begin with. This entry was posted in Lane and tagged Ann Woollard, George Lane, Ratcliffe, Sarah Brown, St Dunstan's, Stepney, The Ship Inn. Bookmark the permalink.